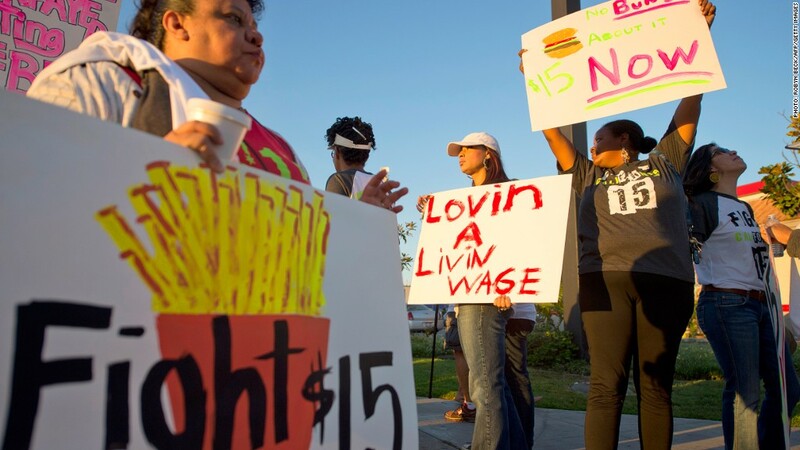 Fast food workers across the country have been protesting since November for higher wages. More than half of fast food workers have to rely on public assistance programs since their wages aren't enough to support them, a new report found. According to a University of California Berkeley Labor Center and University of Illinois study out Tuesday, 52% of families of fast food workers receive assistance from a public program like Medicaid, food stamps, the Earned Income Tax Credit and Temporary Assistance for Needy Families. That's compared to 25% of families in the workforce as a whole. The report estimated that this public aid carries a $7 billion price tag for taxpayers each year. The numbers are based on publicly available data on public assistance programs from 2007-2011. "Because pay is low and weekly work hours are limited, the families of more than half of the workers in the fast-food industry are unable to make ends meet," the report said. The data supports the claims that hundreds of fast food workers have been making across the country over the last year. Protests from New York City to Los Angeles, Memphis to Detroit have cropped up since last November, with workers calling for a minimum of $15 an hour and the right to organize without retaliation. The common narrative among fast food workers is that their pay is too low, they don't get scheduled for enough hours and they get no benefits. The new report fuels their fire, finding that only 13% of fast food workers get health benefits from their employers, compared to 59% of the workforce on the whole. It also said that the median worker only works 30 hours per week, compared to 40 for the rest of the workforce. A separate report out Tuesday slammed fast food giants for pushing their workers onto the public safety net. The National Employment Law Project said that the 10 largest fast food companies in the U.S. were responsible for more than half the total cost to taxpayers -- about $3.8 billion a year alone. The report calls out McDonald's (MCD), Yum! Brands (YUM), Subway, Burger King (BKW), Wendy's (WEN), Dunkin' Donuts (DNKN), Dairy Queen, Little Caesar's, Sonic (SONC) and Domino's (DPZ). McDonald's itself is responsible for $1.2 billion of that cost each year, NELP said. "The leading companies in the industry earn billions in profits each year, award chief executives generous compensation packages, and regularly distribute substantial amounts of money in the form of dividends and share buybacks," the report said. "At the same time...these highly profitable companies' low-wage, no-benefits business model imposes on taxpayers." The National Restaurant Association said Tuesday that the reports miss the fact that the restaurant industry provides "one of the best paths" to a successful career. "Nine out of 10 salaried employees started as hourly workers," said Scott DeFife, executive vice president of policy and government affairs for the association.